Doll's Musings: Wedding Heart Framed, Sunshine Coast Here I Come!!!!! Wedding Heart Framed, Sunshine Coast Here I Come!!!!! I arrived back in Vancouver on Thursday and spent the day holding my hubby close to me. We missed each other so much after twelve days, we didn't want to be parted again. After a day and night of snuggling, I spent my Friday traveling on stinky transit :( I really didn't like being back in the city, especially on the skytrain. It made me tense again, trying to jostle in and out of the skytrain, buses, and stores. Because I am so small, people tend to bump into me and actually run me over!! 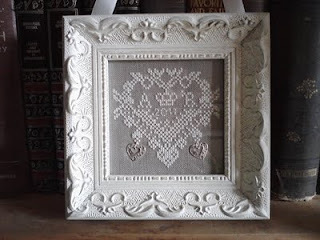 With my shoulders tender, I found my way to Michael's so I could find the perfect frame for my friend's wedding heart that I finished in Prince George. With a lot of humming and hawing for 15 minutes over one so-so frame, I glanced up and saw a gorgeous hanging frame on the side!!! I grabbed it with glee, placed my piece inside to see the effect, and was overjoyed to find that it fight PERFECTLY!!! YAY! 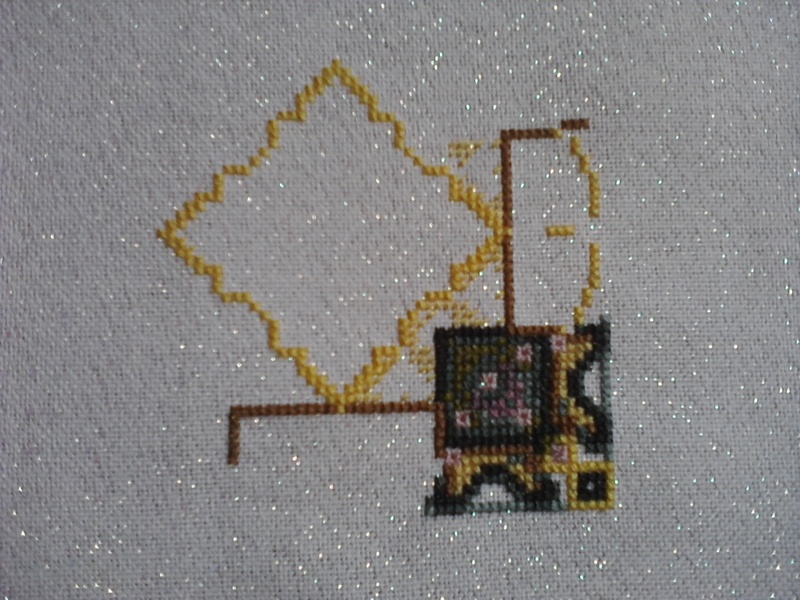 With my frame in hand I also decided to pick up the 30 + DMC threads for an HAED pattern that my mother bought for me!!! It will be my first HAED piece ever! I can see the addiction to those patterns and I have already made a wishlist with beautiful pieces that I dream of completing. Anywho, HAED obsession aside, when I arrived at the counter to pay for my purchases, they had a 15% teacher discount flier! Whoohoo!!! I added the little heart charms to the pattern for a personal touch. I think they look gorgeous, even though I couldn't manage to lay them perfect, they are charming! 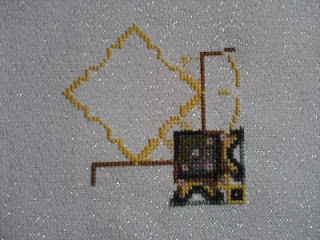 In other stitching news, I did actually throw some stitches into Tanglewood's sky. I'm nearly finished so I will wait til it is all completed to reveal the finished piece. But that won't be until later on this month. I won't be able to keep up with anyone's blog or my own until after August 21st. 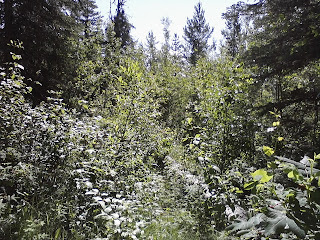 I have tried to comment on everyone's blog, but I am very far behind! Thank you for all the lovely comments on my last post. Your comments encourage me to stitch more and to finish my pieces!! So again thank you, thank you, thank you!!! 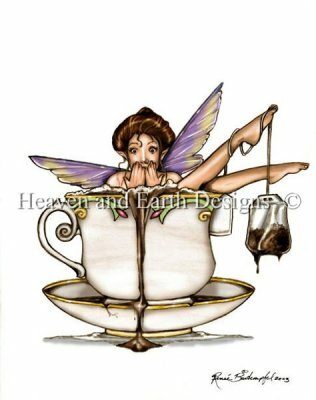 Tea Bath Fairy, isn't she darling?! Oh, and I also started another Chatelaine freebie, Tiny Rose Mandala, stitched on 32 ct Opalescent Lugana. I find this fabric very hard to work with because it is so stiff, but I really like the sparkles!!!! Your wedding piece is gorgeous Anne! It looks fantastic in that frame. 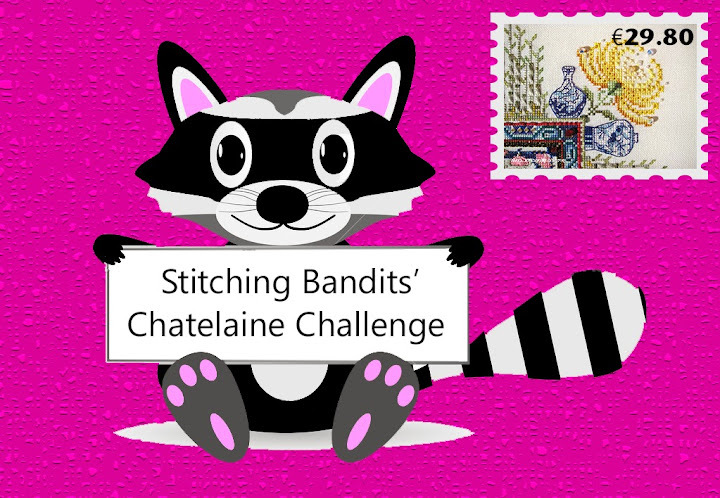 Love your Chatelaine start too. I have yet to try any of their designs but I do love them. Perfect frame for your wedding piece. Just lovely. I love how your wedding heart came out -- just gorgeous! A perfect frame! Beautiful greenery, very lush. They must get lots of rain!!! Love your TRM on that opalescent fabby. It's gorgeous!!! The wedding heart turned out fab too. I LOVE that frame. It's perfect!! Beautiful stitch!! That frame is wonderful, too!! Anne, congratulations on the frame that you found - Perfect! Have a lovely vacation! Summer seems to be finally here. ps I'll talk to you when you're back in town. The wedding heart looks gorgeous. 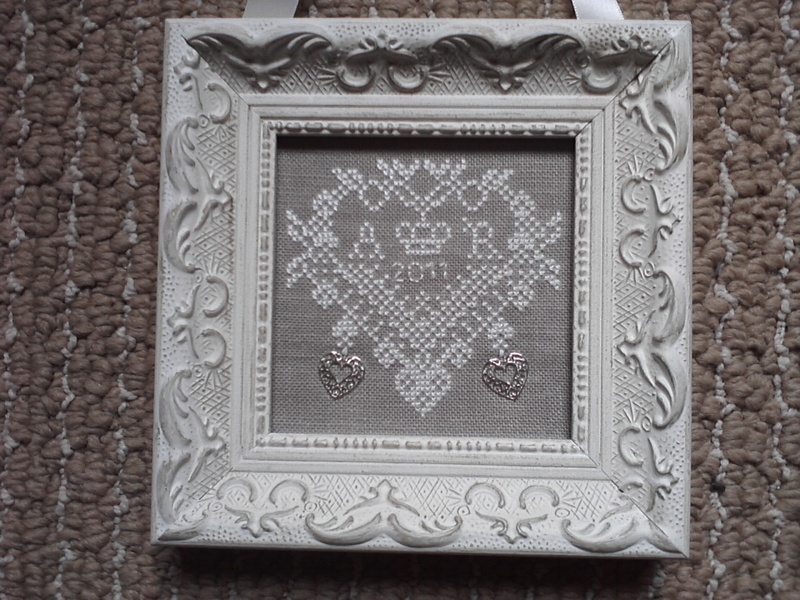 The frame suits it fantastic, so do the 2 little silver hearts. Love it. Gorgeous progress also on your rose mandala. Like you I find the overcrowded city often quite unpleasant. I too love your frame and the stitching. And a teacher discount! How cool is that? Do they do a "Volunteer parent helper and PTA member" discount too? Oh, nice job on the wedding gift, Anne!!! I actually love how the hearts aren't sitting straight. It makes the entire piece feels so whimsical. 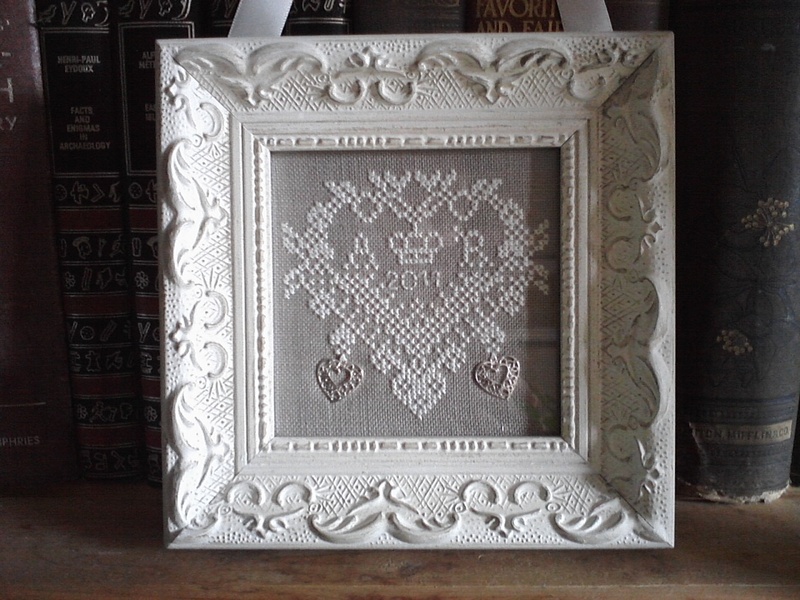 I absolutely LOVE your frame and the wedding heart!!! Your Tiny Rose Mandala is looking great, and the Tea Bath Fairy is adorable!! Can't wait to see your start! Oh, it is fabulous, Anne--I know the wedding couple will be so touched to receive it. Love the wedding heart. It is so pretty and I bet they will love it. Your Tiny Rose Mandala is looking beautiful. I wish you a lot of succes with the start of your HAED, it is a nice pattern! Красивое сердечко!!!!! Схемку скопировала,попробую на досуге вышить! New Start on My First Ever HAED! !